What’s this bloody #looptheworld hashtag thingy all about then? If you’re reading this then I guess you’ve noticed #looptheworld popping up on my social media pages recently. In short, it is the name of the tour I am currently on with my partner Hannah, my loop station and my guitar. However this is not the Rock-Star World Tour that most people imagine. My hope here is to give you a little insight to what it is, where it all began and the plan, or lack thereof, I have for this adventure. #looptheworld is a story, mostly unwritten, that will be told over the coming months…. maybe years. To be entirely honest the story began many years ago. I did not play music as a teenager and never imagined myself to become a working musician. However, I did dream of a job that would take me around the world and allowed me to be my own boss. I guess you could say I’ve been unconsciously planning this adventure since then but for this particular tale let’s say the story began in February earlier this year. I was on Koh Tao in Thailand on another working holiday. I’ve done this many times before, only this time I brought with me my beautiful girlfriend Hannah. Hannah quickly fell in love with the island and the lifestyle and we began talking about taking it on full time. She also managed to complete her Open Water and Advanced Diving courses which inspired a career change that will suit the endless summer #looptheworld existence. Hannah plans to qualify herself as a dive instructor along the course of the adventure. By day she’ll teach ‘em to dive and by night I’ll get ‘em to dance. I started saving, Hannah quit her job, we got rid of everything we own, leased out our room and bought some airfares to places we’ve never been. We started the trip in Melbourne at our local pub, The Birmingham on Smith St in Collingwood with a #looptheworld launch party. Next we flew to Byron Bay where I was a semi-finalist in the annual Blues Festival Busking Competition. Unfortunately I didn’t win however they gave me a spot out at the festival as a wild card anyway. Since then there have been two more shows (The Rails 08/04 and The Beach Hotel 16/04) and there are two more shows to go in Byron Bay (The Treehouse 24/04 and the Rails 01/05) and a radio interview on BayFM (26/04). On May 7th we head up north to the Surfers Paradise Live Festival where I will be performing live both Friday 8th and Saturday 9th May. Sunday the 10th of May we fly to Kuala Lumpur Malaysia, then Surat Thani Thailand. From there it is a bus and ferry out to Koh Tao where we will be staying for seven weeks. I’ll be gigging seven nights a week between three venues – Choppers Bar and Grill, Fishbowl Beach Bar and Banyans Bar and Hannah will be working and diving with Mojo’s Divers. After Koh Tao we fly to Athens then a bus and ferry out to Ios where we will be staying for the month of July. Again I’ll be gigging seven nights a week but this time just in the one venue – Harmony Mexican Restaurant and Bar. Next is where the plan gets a little vague but also a little more exciting. We plan to meet up with my good friend and fellow musical warrior Andy V in Romania where we will purchase a van, deck it out with a bed, a stove and a PA, and hit the road with no destination in mind, driving across Europe. We’ll be paying our way with street performances (busking), the odd gig here and there, and whatever opportunities come our way. We plan to document as much as we can through this here blog, my Youtube channel, my Facebook Page, our Instagram account and the #looptheworld newsletter. – Sign up here. 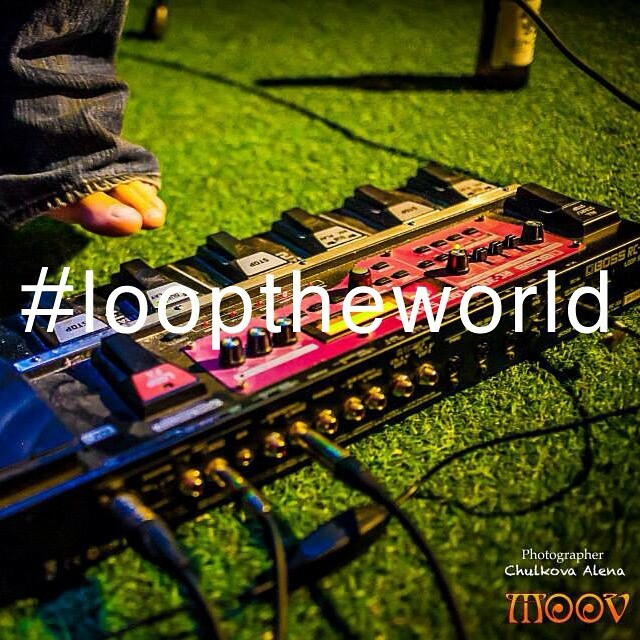 If you’d like to contribute to the narrative simply use the #looptheworld hashtag in your online posts. I won’t be playing to stadiums full of people, we won’t be trashing five star hotels, I won’t be in trouble for punching the paparazzi or getting groupies pregnant that’s not to say there won’t be the odd drama along the way. This is a real tour, two people on a guitar string budget taking on the big bad world, living simply the best we can. And that my friend, is far from the end of the story, but as far as the story goes. In June 2014 I met up with Andy V on Koh Tao in the Thai Gulf to play a string of shows over 12 days. We played every night except one in two venues. Mondays, Wednesday and Fridays we would play at an Aussie Bar named Choppers and on Tuesdays, Thursdays and Saturdays we would play at a bar on the beach named Fishbowl. Though Andy and I have played a lot of music together in the past it had been almost 3 years since our last jam (With the exception of one hip little gig at a whiskey bar in Byron Bay). In this time both Andy and myself had started playing with the Boss RC loop stations. 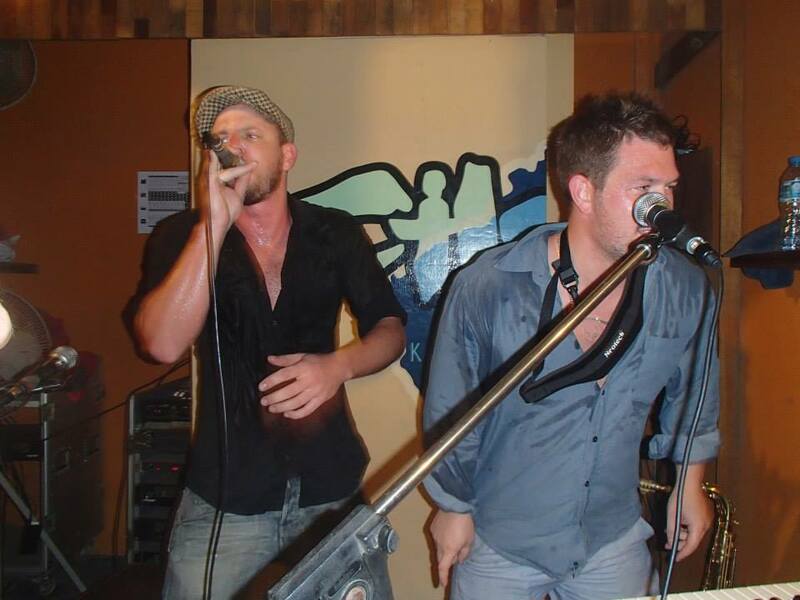 I am on Beatbox, guitar, vocals and MCing and Andy takes control of bass, keys, sax and vocals. It’s amazing what two guys with loop stations can get cooking. It was great fun working with Andy, I learnt a lot and played some of the best music of my life in a tropical paradise. Good times.